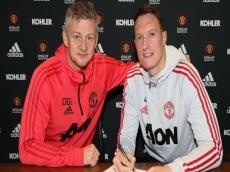 Phil Jones has signed a new four-and-a-half year contract with Manchester United that ties him to Old Trafford until June 2023. The England defender was out of contract at the end of the season but United have moved to secure his long-term future. The new deal includes an option on the club’s side to extend the agreement by a further 12 months. Jones joined United from Blackburn Rovers for £16.5 million in 2011.